Many people mistakenly believe that their membership site income only comes from the monthly subscriptions that they receive. This is far from the truth. 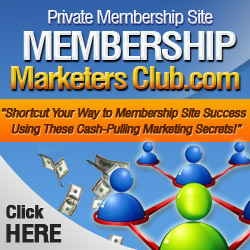 There are several different ways that you can make backend income from your membership site. Here are some ideas to help you turn your site into a profit-pulling machine. Affiliate marketing works really well within the membership site model because you’ve built up trust with your audience. They’ve seen your monthly content and know that you offer quality. They will trust your recommendations because you’ve offered good content in the past. Choose affiliate offers that tie directly into popular topics within your membership site. Ebooks, video courses and short reports will add value for your members and boost your backend sales. Send an e-mail article to your membership site members with good content and a link to the recommended product. You can charge a small fee per month to existing members or outside advertisers to display their text ads or display ads on your site. You can display advertising in the sidebars and just under the header of your membership site. Search for advertising directories to list the advertising space and add the offer to your signature file in forums that you visit. You’ll start to see advertising dollars start to roll in the more you publicize the offer. No matter how much instruction you provide inside of the membership forum, there will always be people who will want something a bit more hands on. You can offer exclusive one on one coaching for members who want that extra help. You can charge this as a one-time fee or as an additional monthly subscription (sort of like a membership site within a membership site). Alternatively, you can offer teleconference calls for membership site members for a small additional fee. There are bound to be topics within your membership site that deserve special attention. You can make backend sales by creating products around these topics and offering them to your members. For example, if you’re running a membership site on weight loss you can create a special report on the best exercises to do to blast through a weight loss plateau. Offer this at a special price to your members. You can also sell the same report at a higher price to non-members to drive traffic back to your website to grow your membership. Once you’ve built a good amount of content within your site, you can start using the content for other purposes. Package up your articles on a specific topic and sell them as a special report. You can even sell resell rights to the report so that your membership site’s name and link is distributed widely around the ‘net. You can do this with several different sections of your website to make some backend income and get new members for your website. With one or several of these techniques you can create several streams of income from your membership site and attract new members.